Download "Reference: Your student number"
1 Frequently asked questions (FAQs) STUDENT DEBTORS Question Where can I make payments? 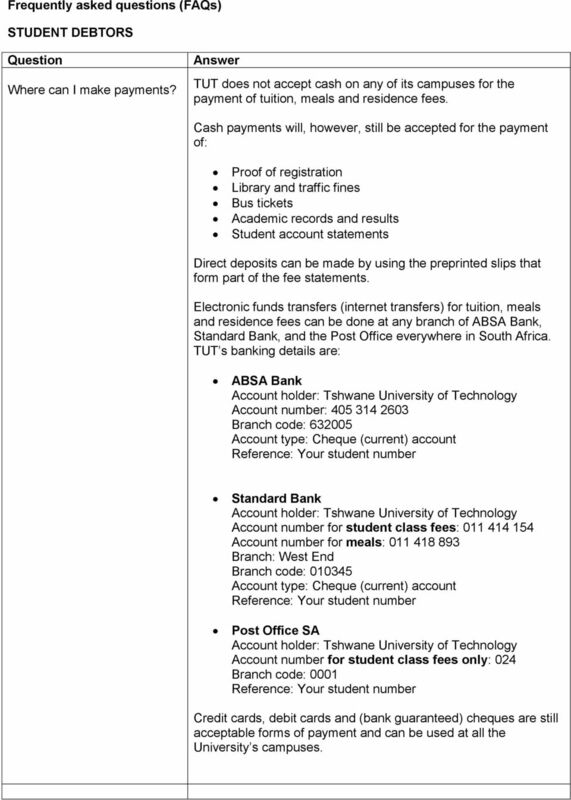 Answer TUT does not accept cash on any of its campuses for the payment of tuition, meals and residence fees. Cash payments will, however, still be accepted for the payment of: Proof of registration Library and traffic fines Bus tickets Academic records and results Student account statements Direct deposits can be made by using the preprinted slips that form part of the fee statements. Electronic funds transfers (internet transfers) for tuition, meals and residence fees can be done at any branch of ABSA Bank, Standard Bank, and the Post Office everywhere in South Africa. TUT s banking details are: ABSA Bank Account holder: Tshwane University of Technology Account number: Branch code: Account type: Cheque (current) account Reference: Your student number Standard Bank Account holder: Tshwane University of Technology Account number for student class fees: Account number for meals: Branch: West End Branch code: Account type: Cheque (current) account Reference: Your student number Post Office SA Account holder: Tshwane University of Technology Account number for student class fees only: 024 Branch code: 0001 Reference: Your student number Credit cards, debit cards and (bank guaranteed) cheques are still acceptable forms of payment and can be used at all the University s campuses. 2 Can I pay with my debit or credit card? Credit cards and debit cards are still acceptable forms of payment and can be used at any of the University s campuses. Can I make stop order or debit order arrangement? Yes. 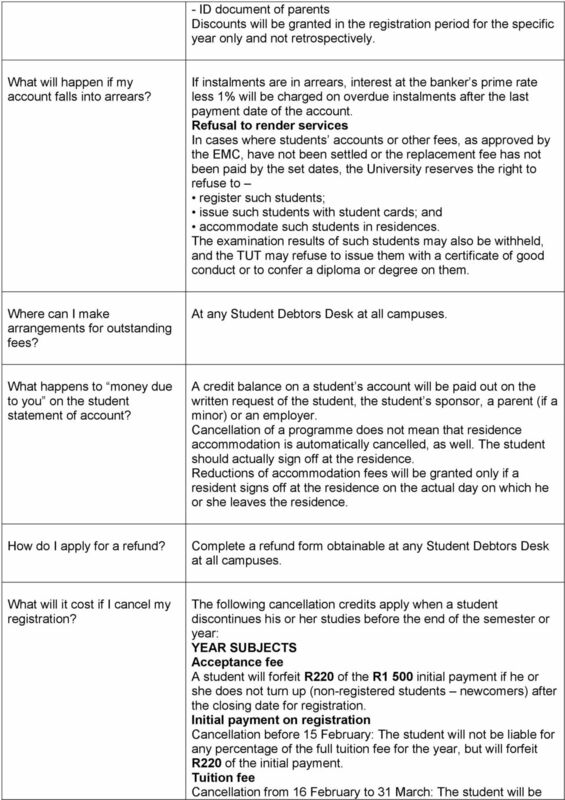 Please enquire at the Student Debtors Desk at any of our campuses for assistance, or phone our Student Debtors officers at or Where can I make stop order or debit order arrangements? At the Student Debtors Desk at any of the University campuses. Alternatively, you can arrange with your own bank to link our banking details with your profile. What is the minimum amount payable for registration? 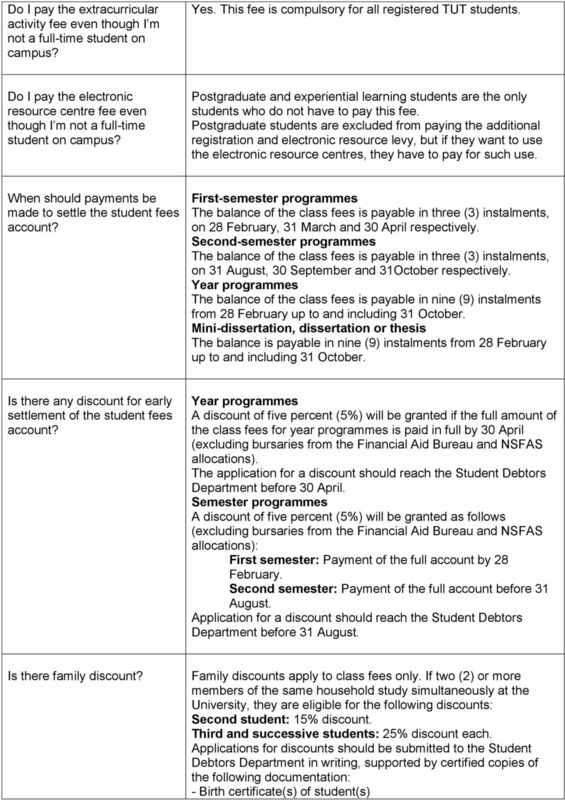 A minimum initial payment of R1 500 is payable before registration, as a first instalment of the total tuition fees. Payment will reflect on the student account 24 hours after a bank deposit has been made. The payments of students who pay at the counters will reflect on their accounts immediately. Can I register without paying the minimum amount? What will the cost of my studies be? No, unless you receive financial aid ( a sponsor or a bursary). Before registration, you can request a quotation from the University Information Office. After registration at the University, you can request an updated student account statement at any Student Debtors Desk. Where can I get a quote for my studies? At the University Information Office every campus has one. Where do I enquire about subject prices? Before registration, you can enquire at the University Information Office at any campus. 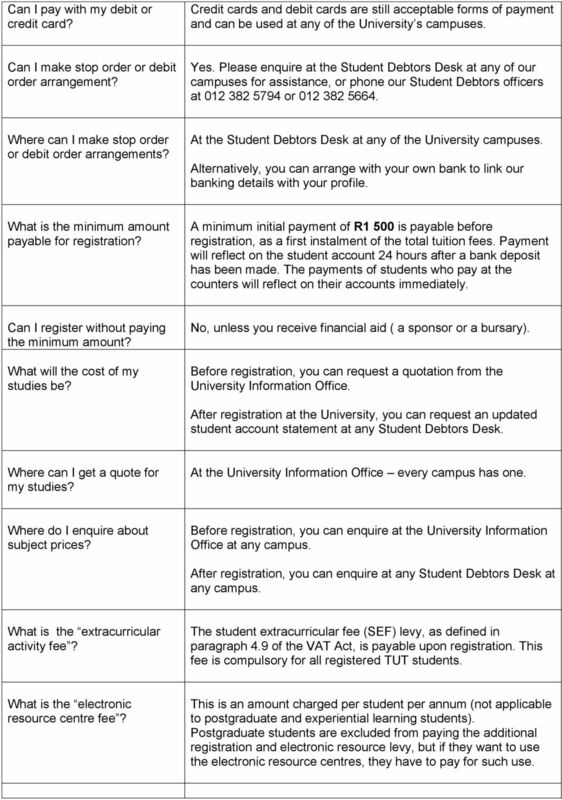 After registration, you can enquire at any Student Debtors Desk at any campus. What is the extracurricular activity fee? The student extracurricular fee (SEF) levy, as defined in paragraph 4.9 of the VAT Act, is payable upon registration. This fee is compulsory for all registered TUT students. What is the electronic resource centre fee? 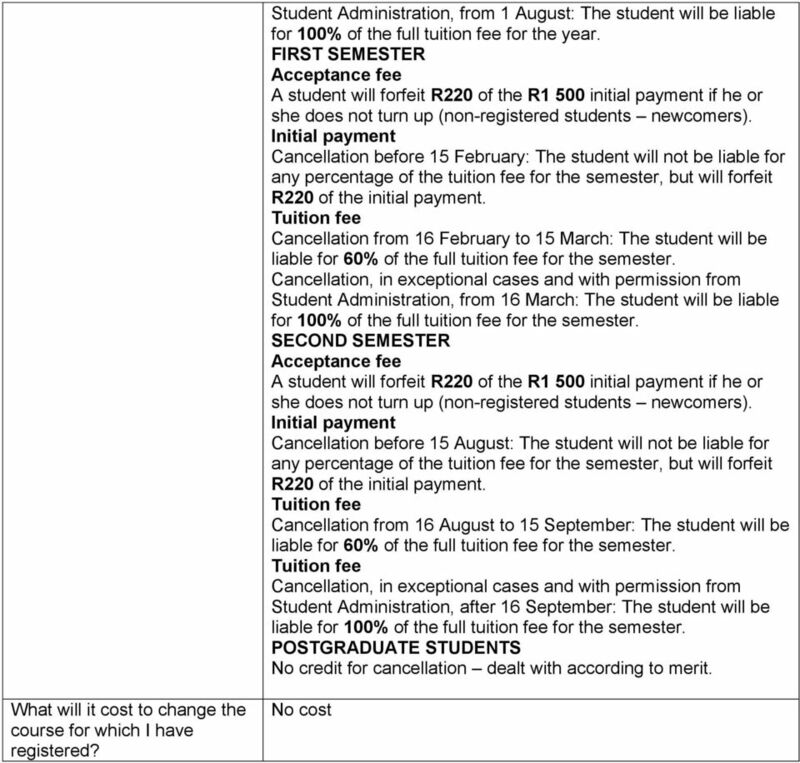 This is an amount charged per student per annum (not applicable to postgraduate and experiential learning students). Postgraduate students are excluded from paying the additional registration and electronic resource levy, but if they want to use the electronic resource centres, they have to pay for such use. 6 50% of the full tuition fee for the year. Student Administration, from 1 August: The student will be liable for 100% of the full tuition fee for the year. FIRST SEMESTER Cancellation from 16 February to 15 March: The student will be Student Administration, from 16 March: The student will be liable for 100% of the full tuition fee for the semester. SECOND SEMESTER Cancellation before 15 August: The student will not be liable for Cancellation from 16 August to 15 September: The student will be Student Administration, after 16 September: The student will be liable for 100% of the full tuition fee for the semester. POSTGRADUATE No credit for cancellation dealt with according to merit. What will it cost if I discontinue my studies? The following cancellation credits apply when a student discontinues his or her studies before the end of the semester or year: YEAR SUBJECTS she does not turn up (non-registered students newcomers) after the closing date for registration. 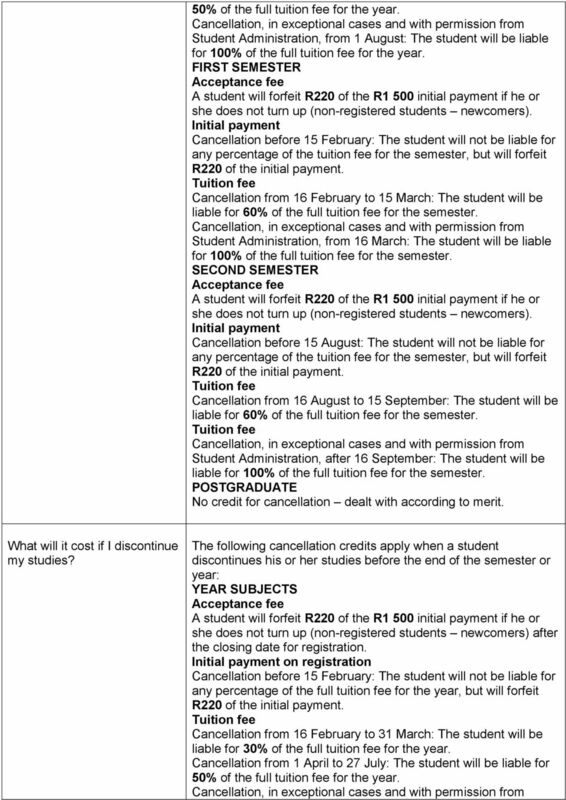 on registration any percentage of the full tuition fee for the year, but will forfeit Cancellation from 16 February to 31 March: The student will be liable for 30% of the full tuition fee for the year. Cancellation from 1 April to 27 July: The student will be liable for 50% of the full tuition fee for the year. 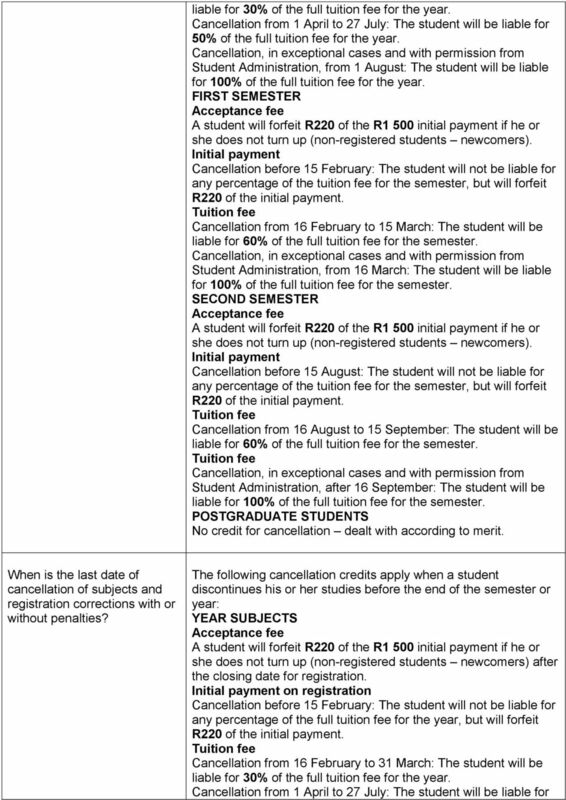 The Council of the Tshwane University of Technology reserves the right to adjust the fees payable without prior notice. 1.3 The policy applies to all students including full and part-time, undergraduate, postgraduate, home and overseas students. INVOICING. INVOICED or dealt with IN ACCORDANCE WITH SU S CASH RECEIPTS POLICY or treated as a DONATION VIA THE STELLENBOSCH FOUNDATION. APPLICATION FORM 2015 INSTRUCTIONS FOR COMPLETING THE APPLICATION FORM VERY IMPORTANT Please read the instructions carefully and complete all applicable sections. Incomplete forms will not be processed. 3. Establish direct deposit with your new account. Send Attachment A to your employer so they can begin processing your payroll to your new account. SCHOOL OF HUMAN RESOURCES DEVELOPMENT. 15,400 (2,200*7) B.OTHER CHARGES (To be paid to the university on the registration day: 1.